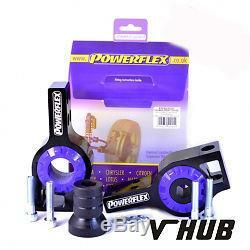 (PFF85-502G) FRONT WISHBONE REAR BUSH ANTI-LIFT & CASTER OFFSET. This polyurethane bush fits into the rear position of the front arm and provides anti-lift properties and 1° of caster offset. It is designed to complement PFF85-501G that fits into the front position of the same arm to provide +/- 0.5° degrees of camber adjustment. This part replaces OE number: 1K0199231J, 1K0199232J & 1K0199231K, 1K0199232K that includes the original bracket and rubber bush. WILL ALSO FIT OTHER VAG MODELS - PLEASE CHECK FOR COMPATABILITY. CAN ALSO BE FITTED AT OUR ONSITE WORKSHOPS. The item "VW GOLF MK6 GTI ED35 GTD POWERFLEX ANTI LIFT KIT PFF-85 502G" is in sale since Tuesday, July 12, 2016. This item is in the category "Vehicle Parts & Accessories\Car Tuning & Styling\Performance Suspension\Other Performance Suspension". The seller is "v-hub-store" and is located in Tewkesbury, Gloucestershire.